Enjoyed by all since 1948, Knife Cooking Oil has been the household name for many generations. Its proprietary blend and unique peanut aroma give consumers total satisfaction with great tasting dishes. 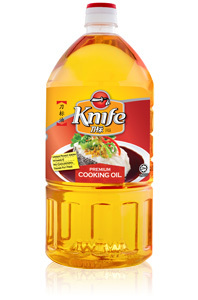 The ever popular Knife Cooking Oil is Trans Fat Free, rich in Vitamin E and has no Cholesterol. Knife added with canola oil is another variant added to the family. It is rich in Omega 9 and endorsed with the Healthier Choice symbol.